Did you know Darkwing Duck isn’t actually set in the DuckTales universe ? I know Launchpad McQuack is here, but, according to the creators (source), they are separate. And on that bombshell. Let’s get dangerous, with the crimefighting mallard! 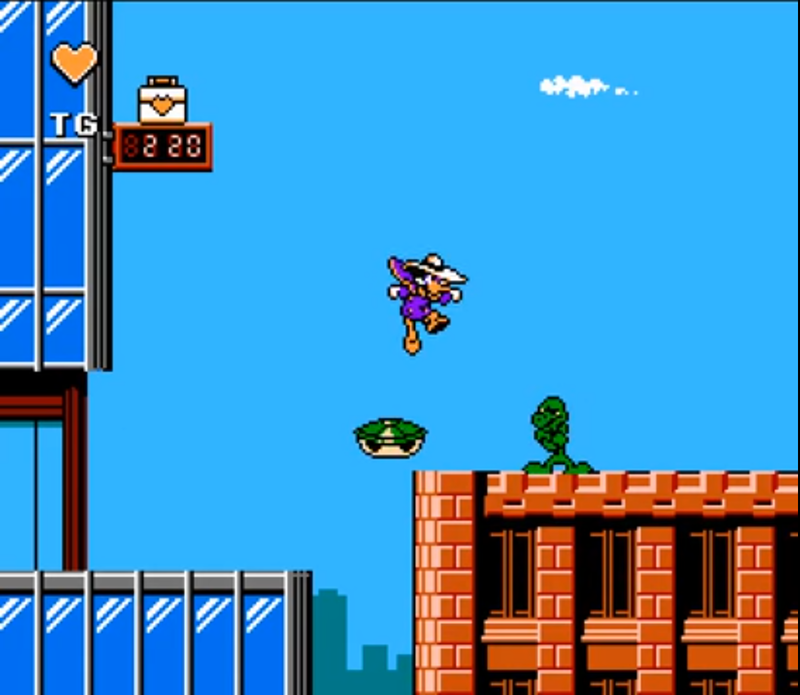 Darkwing Duck is a NES Capcom platformer. So expect tight controls, choice of level order and a totally bitching soundtrack. The difficulty is not DuckTales or Chip n Dale style easy, but at the same time it doesn’t scale the difficulty cliff of the Mega Man games. There are points in the game where it can feel a little unfair, especially figuring out certain boss fights. But if you stop and take a breath, you’ll figure out what to do. There are 7 levels, and they are unlocked in tiers. You get the first 3, once they are beaten, you get another 3. Beat those, and you get the final level. There are no Fire/Water/Ice themed levels type levels, but thankfully there is enough enemy variety, and changes to the cityscape, to ensure the levels don’t become too monotonous. Like Chip n Dale there is knockback when you’re hit, but it is never really an issue. 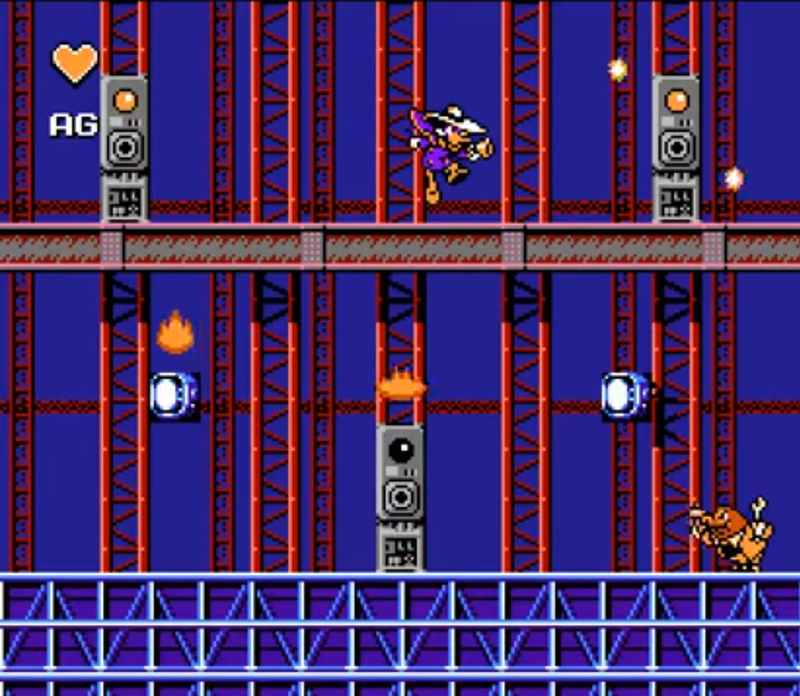 The enemy placement means you’re unlikely to be knocked into a pit, and the areas where this is more possible (on vines/girders) you’ll only die if it is your fault and jump into an attack. So you never feel the rage of Death Mountain in Zelda 2. A mysterious crime wave has hit St. Canard and S.H.U.S.H. – no meaning to acronym, just taking the piss out of S.H.I.E.L.D – requires the services of the caped crime fighter Darkwing Duck to stop it as it appears that F.O.W.L. 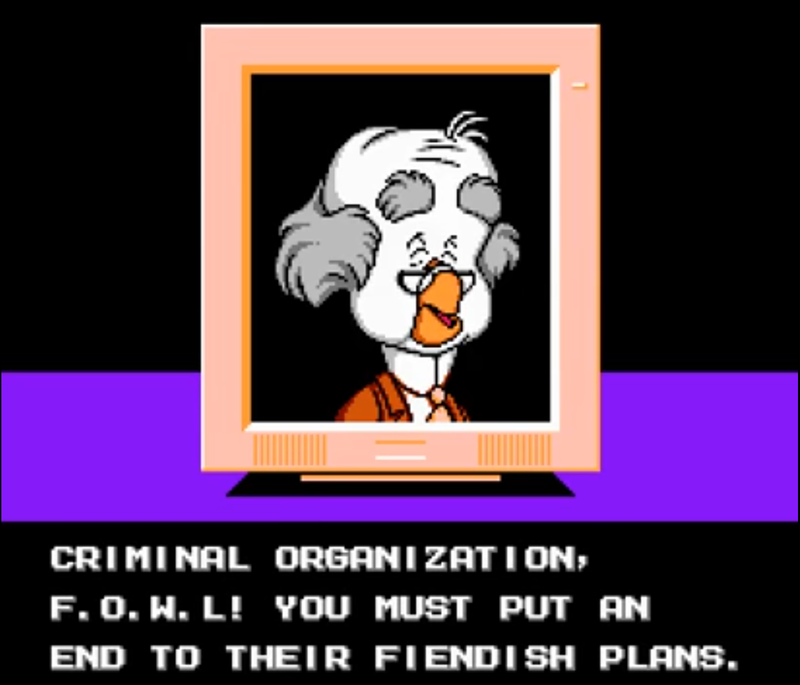 (The Fiendish Organization for World Larceny) and their valued operative Steelbeak is behind the uprising. They have hired six of Darkwing’s greatest foes to wreak havok in different areas throughout St. Canard. 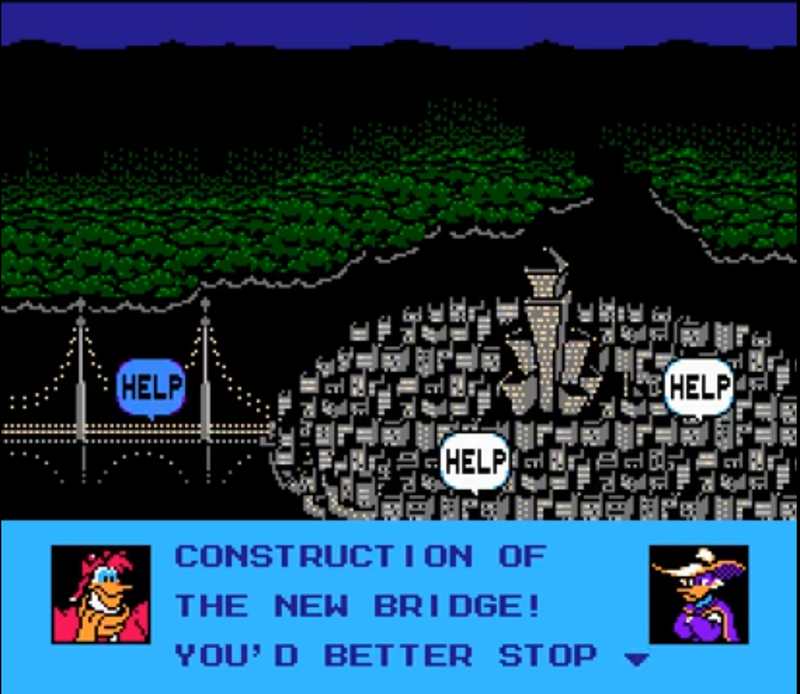 Darkwing must go and one-by-one stop these criminals in order to find Steelbeak and save the city. Quackerjack, Wolfduck (in comics not show), The Liquidator, Bushroot, Megavolt, Moliarity all appear, so fans of the show are getting bang for their buck. If you are good at the game it is only 20-30 minutes long, this isn’t the problem though. 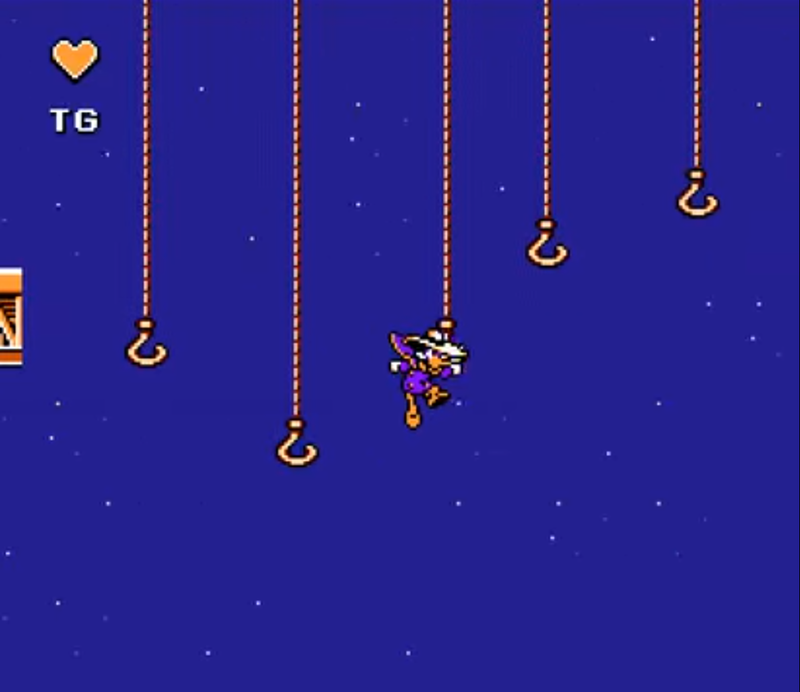 The problem is that it will take you a while to get good, and it took me roughly 2-3 hours to beat Darkwing Duck first time, and you don’t get a password/savestate. There are a few points in the game, especially on the Moliarity boss where I was becoming apocalyptic with rage. I really wanted to save, walk away and take a chill pill. As it is, I had to leave the console on, which isn’t a biggy, but I’d prefer a password system. The other thing is Darkwing Duck doesn’t really try to mix things up. While there aren’t water/ice/fire levels, the levels are fairly hard to describe with only the Bridge and Forrest standing out. Added in the lack of power ups or changing characters, it means the gameplay is a little one note. DuckTales rides this well by having a fun single gimmick, but it means Darkwing Duck doesn’t do as well by comparison. Darwing Duck falls into the territory of “it’s alright, to good”. There isn’t the standout fun of DuckTales, it lacks the multiplayer of Chip n Dale, and there isn’t the depth to it like Bucky O’Hare or Mega Man. It is worth a play though, especially if you like Capcom Platformers. The enemy design is pretty good, and things are mixed up enough for the enemies to never become to samey. Considered a good example of Capcom/Disney Collaboration and while specifically aimed at children, it built a solid audience for older teens due to the slightly harder difficulty of similar games such as DuckTales. Awesome review!! 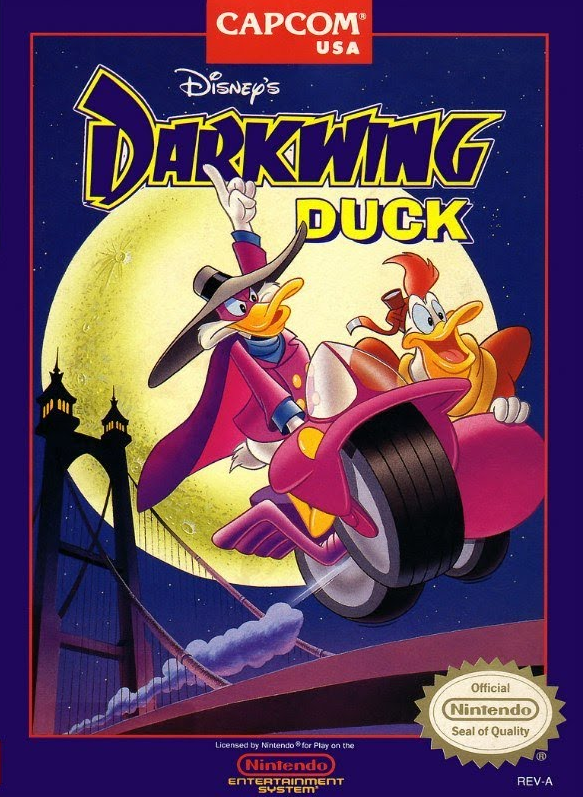 I haven’t played Darkwing Duck yet, so this review is helpful. I absolutely loved that game and nearly completed it back then. I never used the codes though.